The completely revised LED timecode display features double the brightness at less than half of the power consumption of its predecessor. This allowed us to reduce the batteries to only 4 AA cells while still achieving prolonged battery life. Additionally, we equipped the new slate with light and motion sensors. 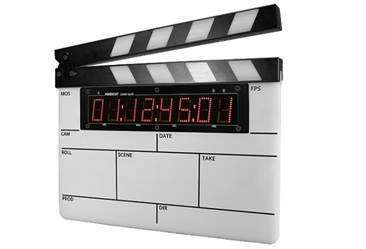 Thus, the brightness can be adjusted automatically to on set light conditions, and the timecode display flips when the slate is turned upside down. The easily removable handle allows for perfect one-handed operation. This new slate comprises clap time broadcast in addition to the same full functionality of the Tiny Lockit including ACN support with clap time broadcast. These network capabilities also allow the » Lockit Slate « to be a fully-functional, generator-buffered timecode transceiver. This provides the same stability of an Ambient Lockit generator that has the flexibility of a wireless TC system but without the fear of dropouts. The Lockit Slate offers a variable timecode offset to compensate for processing delays of digital cameras. Plugged in into a computer, the Lockit Slate transforms into a highly accurate midi timecode interface with LTC / midi timecode conversion and of course big TC LED display. This way the ACN-LS opens up the possibility to sync multiple cameras with a Pro Tools workstation. As known from the Lockit and Tiny Lockit, the user interface is easy and intuitive to use.